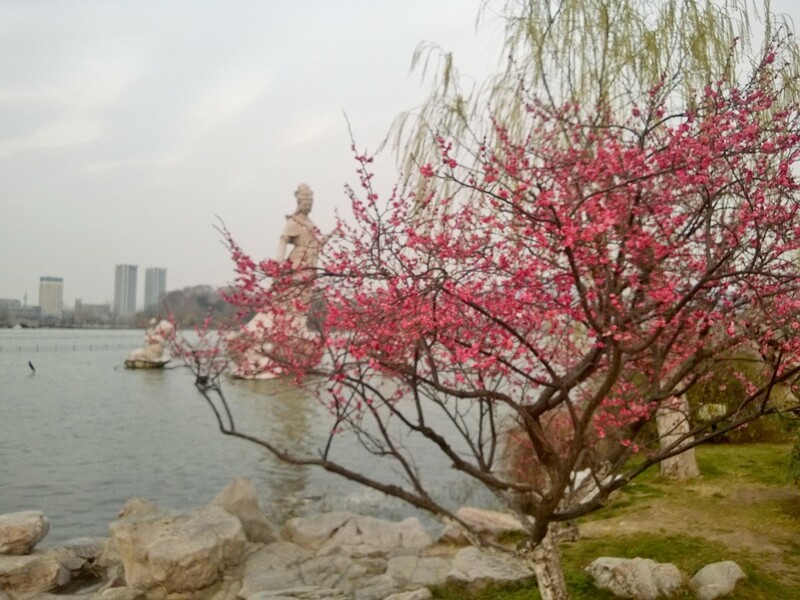 Spring is almost here in Nanjing! From the hotel window, a grey sea of concrete looks totally uninviting but street level reveals small businesses vying for the locals hard-earned dollar and a not-yet-developed city with sidewalks teeming with crowds as they walk to/from work and play. A lovely lake with a park in and around it will provide us with many chances to explore within the stone walls that surround the city, built in the 1300’s to provide protection. 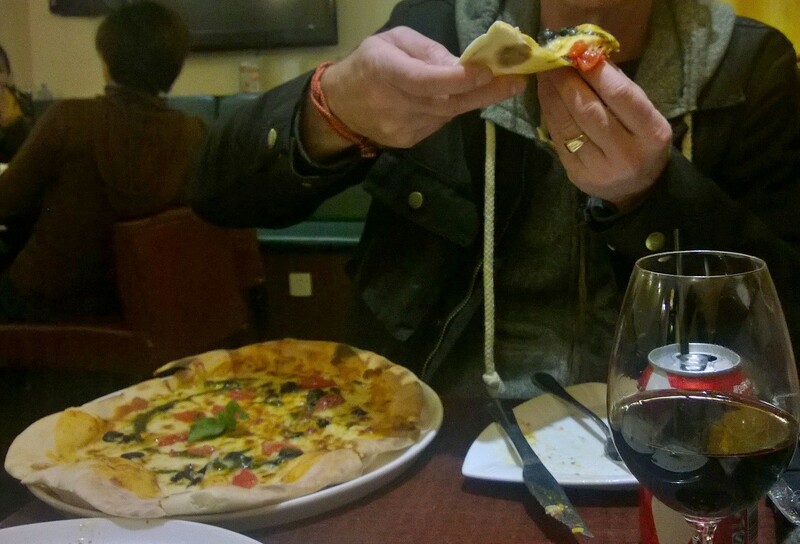 Of course after blowing the hotel staff’s minds with our plan for the evening, Thom and I wandered the streets of a city we have never been to before, walking for miles in the dark to find Pisa Pizza, that came highly recommended online. Finally giving up with feet aching and bellies screaming out, “FEED ME or DIE!”, I asked a friendly barista at Starbucks for help and her friend kindly wrote us out a map and we hailed one of the few available cabs to try and find it. Mr. “I don’t give a damn” Cabbie gave up and let us out without finding it but, determined and stubborn as I am, we continued to roam and finally found it tucked away on top of a stone walkway-totally hidden and out of the way. It looked very “local” but I was not going to leave without a hot pizza pie. Basic cheese with pesto, it was hot & delicious. Of course, by the time we finally found it and then ate, it was late and the last thing I wanted to do was walk back to the hotel far, far away. Oh, we’ll just hail a cab-WRONG! They must be using all the cab apps here in Nanjing because every cab was taken and no one would look our way as we braved traffic to try & hail one so off we trudged home, stopping along the way at another hotel just to use the facilities. The pizza place was a “squat only” so I passed and ended up wishing I hadn’t as we walked miles. Luckily, a Laowai like me can walk confidently into any nice Western hotel and find a lobby restroom. Score! We noticed so many little things about life here as we walked. Karaoke shops with pulsating lights are HUGE and there is a significant lack of Western restaurants that you would find in Shanghai, though McDonald’s and KFC are popular. 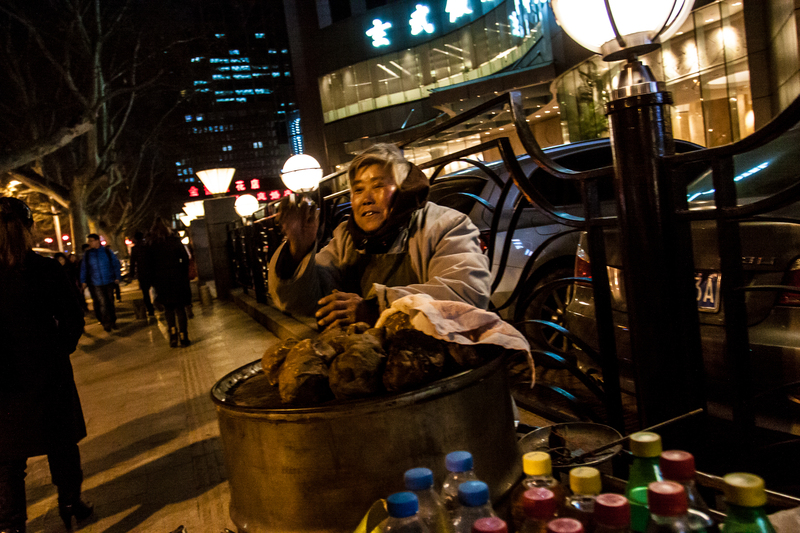 You don’t see people eating on the streets like you do in Vietnam or even Shanghai, maybe because it is colder here? You definitely don’t see the fancy cars like in Shanghai either with more bikes than Lamborghinis. On a cool March night, the people are out walking and enjoying the mild weather with their dogs and families. The streets are clean but don’t expect to find your way with English street signs because there aren’t any–one of the reasons we got lost going out for pizza. We had a map but, hey, it’s China so it wasn’t really made to scale or accurate in any way, shape or form. Tonight, we walked through the park and enjoyed seeing a Buddhist museum. We thought it was closed but the door was open so we peered inside and found a young guy reading a book. He welcomed us, speaking in English and proceeded to share with me the Buddhist culture. 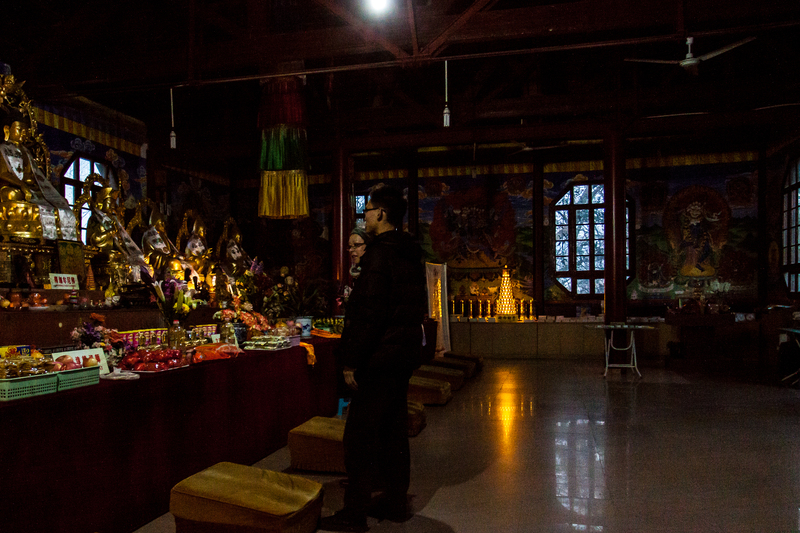 While Thom snapped photos, he and I chatted as he told me that the piles of food were to symbolize sharing and were given to various groups who came to the temple. I look forward to seeing the park and temples later in the spring when the trees are in bloom. Close to the hotel, we walked by a very old woman sleeping beside her sweet potato cart. We had gone about a block when I stopped and told Thom I wanted to go back and buy a potato from her and grossly overpay her. He agreed, of course, and off we went. Waking her up with a cheery, “Ni Hao!”, she carefully weighed the one I picked out on her ancient wood scale and asked me for 5RMB. I handed her the 100RMB note and walked away smiling. She returned my smile after it dawned on her what I was doing and she waved and repeated, “Celia”, meaning who knows what but if my late night sale allowed her to end her very long day of hard work with some money in her pocket, then I am happy. If I ever think I am having a hard day, I will look at my new screensaver on my fancy way-too-smart phone and I will smile at my dear sweet potato lady. God bless her. You are both too cool and love the blog!! Can’t wait to visit…. Come visit and stay with us!! The guest room is ready!